Andromeda Software produces a number of series of Photoshop compatible plug-ins. The series are: Photographic Tools and Lens Effects, Artistic Screening Tools, Graphic Design Resources, and Scientific Tools. 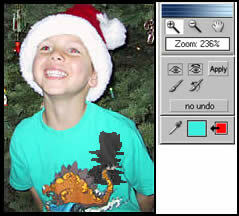 They also make plug-ins for PageMaker and offer Online services such as eFXservices.com - an online Photo Effects site and eARTservices .com. Andromeda's latest Photoshop compatible filter is part of the Photographic Tools and Effects series. 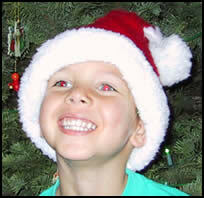 This filter is easy to use, inexpensive, and removes the red eye from a picture in a flash. 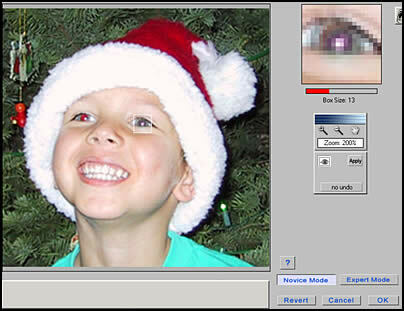 Andromeda's RedEyePro is a photoshop compatible plug-in that will correct the red eye produced from a camera's flash or other color distortions even though it is intended to correct the red eye. It is compatible with Photoshop 7 in all versions of the Windows OS and the Mac OS's including OSX. The requirements are very basic. They are: Photoshop 4 or higher or other hosts that accept Photoshop plug-ins, and for Windows, a Pentium processor. The filter sells for $39.00. Special offers are available from the Andromeda website. This filter can be used in two basic modes - novice and expert. There is a short, clear, and easy pdf manual on the CD that walks one through the correction steps using two examples that are included on the CD. I used these to demonstrate how this filter works. The novice mode is used to fix red eyes only. It should not be used to correct other colors. To accomplish that, one must use the expert mode. The following examples show the before and after shots. The next examples show screen captures of the two different modes and the controls for each. The first is the novice mode. For this mode, all one has to do is drag the square box over the red eye and it will correct it. One can make the box bigger or smaller to fit the size of the eye. In the expert mode, one can correct the eye color by means of a brush. Initially, an eye dropper is used to choose the color to correct. It will appear in the box on the right. The color chosen in this example was lavender to correct for some lavender pixels. The size of the brush can also be controled. All one has to do is drag the brush's circle over the area to be corrected and it wipes the color away. 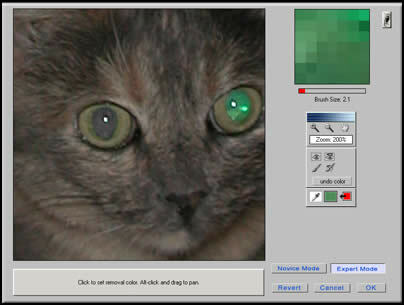 A dramatic example is shown by the cat's eyes in the picture below. Notice the close up on the right shows the green of the left eye which needs to be corrected. The right eye has already been corrected using the same method as described in the immediate example above. Next I chose a color on the child's shirt to demonstrate how expert mode can neutralize any color. Notice how the brush only changes the green as pictured in the small box. If you look at all the examples, you will notice that the filter turns the eye a neutral color. No filter can read the originals colors that "red eye" has obscured. It, does, however, as can be seen by the examples, preserve the gradations of pixel shades that make up the corrected image as well as the highlights contained in the image. If you are plagued by red eye in your pictures, you never need to be plagued again. This filter is easy to use, inexpensive, and mistake proof.